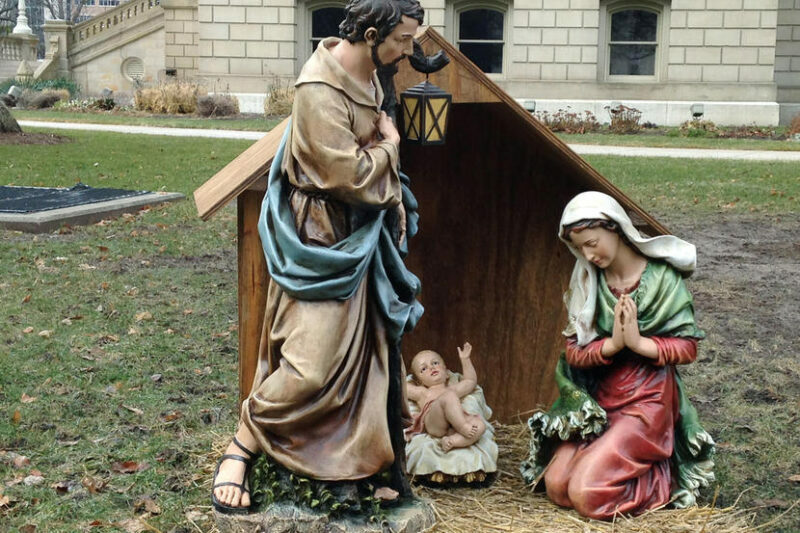 For the seventh year in a row, the anti-religion activists at the Freedom From Religion Foundation (FFRF) have erected an outrageous sign outside the Illinois state house denouncing Christmas and Christianity. Dan Barker, FFRF co-president, said his group is opposed to the nativity scenes and other Christian symbols that appear on public spaces during the holiday season. So the atheist organization wants equal space to spread its anti-religion rhetoric during the Christmas season. And the FFRF is not stopping at Illinois. FFRF has announced plans to erect similar signs at the Texas and Florida state houses. This isn’t the only attack to remove Christmas from the public view, either. Already this month the anti-religion organization put up a “Reasons Greetings” (an attack on the term Season’s Greetings) display at the Warren, Michigan city hall. 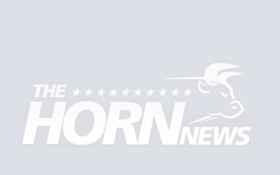 The organization also recently announced a lawsuit that has banned the Concord Community Schools in Indiana from performing their traditional live nativity scene at the school’s 2015 Christmas Spectacular holiday concert. They claim to want everyone to respect their private beliefs. Then they demand that their non-beliefs come first and try to curtail others freedom of religion. trying to form groups and tell the rest of us what to do. All aethists and other totally non-believers need to leave the country!! Most intelligent people believe in some religion. Who put us here, and who will take us away? Who formed the ability to reproduce? Who formed the earth and the other planets? Why can you plant a seed in the ground and it will grow? Wake up idiots before it is too late. Actually, if you look at anything pertaining to the founding fathers, you will see that it was founded on religious freedom, not Christianity. ‘God’ wasn’t added to money or the pledge until the ’50s because of a fear of Communism. It originally said “E pluribus unum” which means “from many, one.” I won’t “GET OUT” because of your denial of history. They are trying to show that everyone has the right to be represented on state grounds. Either everyone has a right to put up their signs, or no one does. That is equality. Religion forces people to stop asking questions, Science forces people to keep asking. Oh Lord, another one of THOSE! First? Seems to me all they want is equal space. Where’s the beef? They will get equal space in the Hell for not believing in God who created them and everything around them. Don’t they realize that they are enjoying many of God’s blessings every moment of their life? No, they don’t because of arrogance that comes from devil who is leading them straight to Hell. Five seconds after you die you will know there is a hell. Just don’t be in a hurry to die to prove me wrong. Well, if there was a Hell and I went there, at least I wouldn’t be surrounded by a bunch of hypocritical a$$hats who enjoy the thought of men, women and children being tortured. Plus, the company would be better. Thankfully, I don’t have to worry about that. Yup, and then it’s too late. If I were one of “them”, I would rather believe and be saved than not believe and spend eternity in hell with ol’ Dace. Those of us who have had near death experiences find it very easy to believe. However, those who don’t are certainly welcome to “wait and see”. God doesn’t force anyone! You said it yourself – “private”! So keep it private and off tax payers’ facilities – what is so difficult about that? Nobody is taking away, or curtailing, your rights! You have the right to your beliefs! just not on “our” government space. Then we also can stop this nonsense of having to defend the rights from religion which is clearly implied in the Constitution with equal rights for ALL equally. For some reason you do not see the equality in this message. Stop your demands for your beliefs, whatever they may be, to be flaunted in everybodys’ faces. You all do realise that by continuing to demand all these special privileges for your religion that you keep the door open for the Islamists to do exactly the same, and if you have been paying attention they are demanding a whole hell of a lot more, especially with their Sharia, and we all will have no option but to submit. It is highly suggested that we continue secularising our government and all public facilities. They will stomp all over us!! Actually, if they really believed there were No God, No Jesus, No Angels, No heaven or Hell they wouldn’t put up such a fuss. If the FFRF want to publicly display their beliefs. Us religious people have a right to display our beliefs to, whether it is the ten commandments or a Christmas tree or nativity svene. Watch out the FFRF might want to ban Christmas trees, Christmas decorations, Shabbat candles and Hanukkah menorahs. Thanks FFRF for the decorations on your atheist manifesto. You have no idea that you are actually wishing everyone peace through Jesus. So please enjoy the following and I wish you all peace through Jesus this wonderful Christmas! Mistletoe is more than a kissing plant — it was once known as a plant that represented peace. WONDERFUL! Go back and read it again because God will be with you all, in this holy season! Love your neighbors, as we were told to by Jesus Himself! A symbol has only the meaning an individual gives it. You’re telling the truth! Those mutts are gonna hate your comment…plus, it makes sense! What a sad day in America, This Country was Founded on Christian Principals, I Hope God Forgives them. They want to live their lives like there is no God. They are really concerned that we acknowledge God. Aren’t they doing the same as they are saying against Christianity? Hardening hearts and enslaving minds? Why the hate? You’re right, why all the hate? I am an atheist and I find the actions of this group “FFRF” to be a huge embarrassment. You’re right, they want to deny you the ability to profess your beliefs all the while spewing their beliefs. The stupidity and hate is unbelievable. As a life long atheist I have always been very grateful that I lived and grew up in a society that was built on Christian beliefs. Thank you and your brethren. You are the first Atheist that I have ever seen thank the Christians and not tear us down. Obviously you do have some of the integrity it takes to be a Christian, so all hope is not lost, even if you are a lifetime Atheist. May God have mercy on all of their souls for being so hateful. God is LOVE, which means Jesus is also LOVE. We don’t try to force our faith on anyone, yet at special times of the year, we do set up scenes to depict the Bible and the reason for our faith and belief. Why they feel they have to force their views on us, I have not quite understood. Perhaps they are so hateful, they feel everyone must become as miserable as they are. Everyone have a Blessed Merry Christmas, and let us ALL remember, Jesus IS the Reason for the Season!!! First, i don’t believe you’re an atheist. Second, if you want to display your particular beliefs in the public space, ALL other beliefs (or lack thereof) are entitled to equal space to espouse their beliefs as they see fit. Remember, the 1st Amendment still applies in the public space. Actually, they aren’t. If the Nativity scene wasn’t there, than they wouldn’t have their sign there. They aren’t asking to be able to put up a sign and not let others do it, like Christians so often do. If they were, THEN I would have a problem with it, but since they are just wanting equal rights, I have no problem with it. Why are we putting up with this crap? America is built on “IN GOD WE TRUST” If you don’t like it LEAVE~!!!!!!!!!!!!!!! How very xtian of you. I LOVE YOU………YOU ARE SO RIGHT ON……..GET BEHIND ME SATAN…….THIS IS CHRISTMAS……..THE WORD IS “CHRIST” IF YOU WANT TO CELEBRATE HENOUS DAY, GO RIGHT AHEAD……..BUT THIS CELEBRATION IS ABOUT “CHRIST”MAS. GET OVER IT. TELL RETAIL YOU WANT TO ABOLISH “CHRIST”MAS………….SEE HOW THEY FEEL ABOUT IT………. You poor thing. The “X” is actually indicating the Greek letter “Chi”, which is short for the Greek, meaning “Christ”. So “Xmas” and “Christmas” are equivalent in every way except their lettering. The first written account of it being used was from the 14th century, long before it became commercial. Also, nothing about Christmas, except the name, is about Christ. I challenge you to find one thing that is unique to Christianity. There were 13 deities that were ‘born’ in December, predating Christ’s alleged time. Gift giving was done by children giving wax dolls during Saturnalia, representing the human sacrifices that Rome had given to Saturn as payment for a good harvest. The stockings can be traced back to Scandinavian Pagan beliefs where children would leave their shoes outside filled with foods for Odin’s horse and after the horse would eat, Odin would leave candy or other treats. Wreaths, Trees, Caroling, Mistletoe, Santa, Virgin birth, resurrection; none of them are Christian. Also, using all caps doesn’t get your point across, it only shows that you aren’t able to back up your ideas with proof. Spike…. I am very sure that most Atheists are like you. Tolerant and good people. The fools who put up those signs are just small minded, ignorant people looking for attention and, to validate their lives. I find them very easy to ignore. GOD MADE THE TREE THAT PRODUCED THE PAPER THAT THEIR SIGN WAS ON. Actually, there is a lot of evidence that ‘he’ didn’t and millions of years of evolutionary change made them. But okay, living in a ‘God made’ box is cool too. I’m sure all these FFRF folks refuse any time off with pay for the holidays, and insist on working regular hours to show that they do not want to celebrate. NO? then perhaps they only protest that which does not benefit them? The Constitution does not grant freedom from seeing others practice religion any more than it grants freedom from seeing sunlight to those who think they are vampires. It does, however; grant freedom from being forced to BELONG TO OR PRACTICE a specific form of religion, or any religion. I could best be categorized as an agnostic and I think it’s shameful how this and so many other activities are undermining American society and the western world in general. 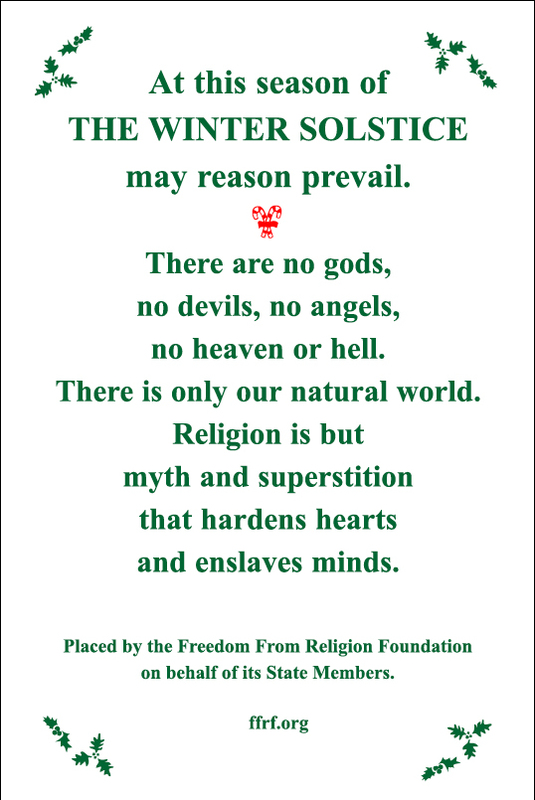 If the PUBLIC allotted areas on which “RELIGIOUS” based Depictions are allowed during the HOLIDAY SEASON of CHRISTMAS, WHY then , is the FFRF organization ALLOWED to do the same, since they are NOT a RELIGIOUS ORGANIZATION, but an ANTI-RELIGIOUS Organization?????. Two direct Opposites !!!! It would seem to me that the FFRF should have a site made available for them in an AREA that is NOT in conflict with the Religious groups. I say this as a means to avoid any confrontations that may occur as a result of the differences of both parties. It’s on government grounds, so if one gets to do it, the other does. That’s equality, even when you don’t like it. In reality, they do believe in God. If they didn’t, why worry or bother so much that other people do? It is very hypocritical of them to believe and say one thing against religion and Christianity, but still demand there beliefs and voice heard. As Americans and as the majority who believes, why do we continue to allow them to have their way and exercise their freedom of speech and freedom of religion? Time to put our foot down and say, “Enough is enough!” God Bless America…. It can only be hypocritical if they, say, diss JC all year round but on 25th Dec fervently celebrate his birth. Because you force your 2000 year old anti-science, anti-history, anti-women, mentally ill ideas on Atheists. So, no, we don’t believe in a god, but we do believe in equality. Something that Christianity has been against since it’s founding 2000 yrs ago. And you’re right, “Enough is Enough” so when you stop trying to push your archaic fairy tales on others, then that is when it will stop. You aren’t special and until you realize that, we will keep fighting for our freedom. Stop trying to put your crap in my schools, and in my government and admit that we are equals and then see how quickly the argument will end. You can believe what you want, but that means I get to believe in what I want without having to look at your crap on government grounds. Our 1st amendment rights are being attacked from all sides. Some organizations really go too far and this is one of them. They are trying to justify their existence by do this. Just as the “Great Generation” responded to Dec. 7, 1941 and fought back against “Imperialism” we must rise to this challenge to fight back against atheism and their piers the Islamists. Wouldn’t want those dirty atheists demanding equal rights!! It’s unAmerican!! You did receive, not just the application, but the option to waive any ‘application’ process; it is called “Free Will”. Again, YOU have the “Free Will” whether to accept Jesus Christ as your savior, or not. If you do accept and follow Jesus Christ, you will benefit, and your soul will reap the rewards for eternity. This cannot be changed, obliterated, nor censored. We know the Book, the Ending, and we triumph. These little things do not matter in the long run. commercialized Santa Claus, Elves, and Reindeer scenario. date, but we do know it was not Dec. 25.
that we, who are watching, know the signs of the End Times. creating misery; gnats eventually get slapped down. Putting that sign up will not shake my belief system, As long as they leave the navitity scene alone, people will see the sign and think what a shame that people are deliberly going to hell. They choose not to believe, and thats their right. The sign is sort of pathic, let them put it up,n those of us that believe won,t be affected adversly. Coincidentally, we posted similar thoughts at the same time. That is a God moment. I decorated our Guard Shack in our HOA last year with a Menorah for Hanukkah, and colored lights for Christmas. Got a call from a lady telling me to take down because she was an atheist. I told her that I had all bases covered ” a Menorah for the Jewish people, Christmas lights for the Christians, and NOTHING for the atheist. She hung up with a few swear words. I love this story. Good response!!! Excellent answer! !! I applaud your attitude. I have seen the same lack of grammar, punctuation, etc. Our educational system never has been at its best. Take that from me, a teacher for 25 years. Some of the students were exceptional. Some of the students were rebels. regret their lack of communication skills. You’re the ‘accomplished’ “former engineer, physicist and “absent-minded” upper division and grad level prof,”. Instead of the demonstration of your passive-aggressive disposition, maybe you could go out amongst the nation to teach proper English, as well as, its various forms and endless uses. I agree partially with this Anti-religious Activist: There is no god, no angels, no heaven specifically for them. Unfortunately what there is for them is a devil and a hell. Even with disbelieve, they need to pray there is truly no hell, Maybe they can forfeit a ‘ little burning’ in eternity. The rest of us, hopefully will see each other in heaven. destiny of all of mankind. Yet, He allowed them to be born. Maybe Jehovah God would be pleased if we were a peaceful people.Doing all we can do to make for peace. We can do our part for peace by being thoughtful of our neighbor first…. Please. …. Let us not insist on having our way in the market place. Romans 12:21 Overcome evil with Good. You must use credit cards to do your shopping because all the US currency I have has the inscription ” In GOD WE TRUST” on it. How do you keep that out of the marketplace? The Freedom From Religion guys are more interested in forcing atheism on us than anything else. One way to get around some of this would be for groups to put religious themed Christmas displays on churches and other private property. That would end most of this foolishness since these atheist groups generally don’t own property or have a presence in any town. If people of faith are right, the FFRF followers are going to be in for an unpleasant surprise a few moments after they take their final breath. You put up your sign, so we got to put up ours. Don’t like it, too bad. That’s equality. world history is wrong and only they have the truth! In reality their god(s), are just themselves! People would have seen Jesus as an atheist being against the scribes and pharisees. The Atheist says this seeing externalism from false Christians. The statues teach nothing. There isn’t any mention of Jesus being the Mighty God. It is Satan wanting Jesus to be a perpetual baby. A baby teaches nothing. The people who put up the nativity scene are liars. Hell is not a place. Atheist’s see this on subconscious level. People would have seen Jesus as an atheist being against the scribes and pharisees. 1611 King James Version of Malachi 4:3 – And ye shall tread down the wicked; for they shall be ashes under the soles of your feet in the day that I shall do this, saith the LORD of hosts. Malachi 4:1:For, behold, the day cometh, that shall burn as an oven; and all the proud, yea, and all that do wickedly, shall be stubble: and the day that cometh shall burn them up, saith the LORD of hosts, that it shall leave them neither root nor branch. Hebrews 12:29 for our ” God is a consuming fire.”1 John 1:5 – This then is the message which we have heard of him, and declare unto you, that God is light, and in him is no darkness at all. I should let this go by, since I have a lot of things to do here, around my house, but I just have to intercede by commenting that the above post is not accurate, in my opinion. People who put up nativity scenes are far from liars.. they do not lie about their belief in the birth of Jesus. I don’t see how you can equate this demonstration with prefabrication. Also, Jesus would not be seen as an ‘atheist’ by any of the populace..He declared Himself as the Son of God, and you don’t say that when you are an atheist. It does not compute. He may have been seen as a ‘troublemaker’ when He became angry with money-changers, pharisees and wrong-doers, although He showed compassion, also, for sinners, teaching them that they must change their ways in order to be of God’s chosen who have repented. The final scripture, in Him is light.. that is the truth of the matter. ISIS and their ilk= darkness and evil incarnate. and that Chinese guy, whose name I cannot ever spell right, plus other dictatorships that have existed in our contemporary world. There has always been EVIL and now with global communication we know of it first-hand. to His disciples and to Him, still there were nay-sayers. It is a flaw in Mankind, and to not have that flaw within yourself is to be blessed, indeed. Who are these “People” to which you refer? contradicting this as being an unknown quantity. those words alone qualify Him as not being an atheist. I am hoping you addressed your reply to the whitefox. To some what I say will sound totally against the way a Christian would reply, but keep in mind that God used His people, and Angels, to destroy and to kill numerous populations of people. He not only destroyed their towns and villages but He ordered His armies to leave nothing or no one alive. With that being said: We as Christians have begged these groups of people including the ACLU, Gays and the Freedom From Religion foundation to change their direction, and to STOP abusing the rights of Christians while using the same Constitution to strengthen their causes. Jesus said to turn your back on these types of people and knock the dust off of your shoes and never look back because they ARE GOING TO HELL. So, let ’em have their little rant and rave parties because they are going to spend eternity on Satan’s Bar-B-Q menu. Personally I think that is hilarious. At first the FFRF sign appears to be offensive to me. But after further thought it is contrary to all the religious ideas I believe in. In this time of commercial advertisements it is easy to forget the real meaning of Christmas. This sign makes me realize that I am fortunate to live in a country that allows me to worship within my religious beliefs outwardly and without the fear of prosecution . In many countries throughout the world this is not possible. The sign makes me feel sorry for people who can only try to attack and destroy those values people of faith live by daily. When you stand for nothing you are nothing. So let the sign of the FFRF remind you that you are indeed a person who has a soul and believes in something beyond nothing. You obviously are not going to release my comment. Your standards are questionable and curious. Thanks for your consideration anyway. I stand corrected . You did release my comment. Thank you. IF THEY DON’T BELIEVE IN GOD THEY MUST KEEP THEIR MOUTH CLOSED BECAUSE GOD PROVIDES EVERYTHING IN THIS WORLD. THEY SHOULD DEPART AND GO TO YOUR HOMELAND SINCE THEY LOVE TO GO TO HELL. IF THEY DON’T BELIEVE IN GOD THEY MUST KEEP THEIR MOUTH CLOSED BECAUSE GOD PROVIDES EVERYTHING IN THIS WORLD. THEY SHOULD GO TO THEIR HOMELAND IN HELL TO ENJOY THEIR WISHES WITHOUT GOD. Other than the extreme, how is this organization any different than the Islam convert or die crap? We are being forced to see their views, whether we like it or not. Christians are taken advantage of because we are chumps. They know we won’t do anything. It’s turn the other cheek and in the case of extreme Muslims, both cheeks fall to the ground with your head cut off! I am not a bible thumping Christian and I pretty much keep to myself, but I feel myself evolving. In the case of convert or die, God tells us to smite evil. I am not converting and if in this situation, I guess it will be determined who died! These goofs have absolutely no right pushing the celebration of a pagen holiday, which is not even the same day as Christmas on me and my family if we are in their minds not allowed to celebrate Christmas with a nativity scene. What really bothers me is all the commentary by the press about the holiday party that was being celebrated by the.people at the.time.of the assassinations. In the beginning,it was Saud to be a Christmas party, but has now morphed into a Holiday party. People wonder in the US as to why there are so many bad things happening to this country. In my view it is because we have turned our back on God over the last 20 years, by trying to erase.him for political correctness. Look, I do not care who believes what, but nativity scenes have been around since I was a little kid in the 50s. Our country was founded on Judeo Christian beliefs, not the Soals, not Allah or Mohammed. We are rendered to as a melting pot, except no one assimilates anymore. They bring their beliefs here and force.then on us! If one doesn’t believe, fine, but either keep it to yourself, or find a country that is communist that will let you express your views! Pretty soon, we will have worshippers to the Greek gods and we will have to put that crap.on public space! Non believers, I respect your right to not believe, but I don’t respect you throwing your beliefs in Front of my family or myself, when this country was founded under God! Christmas is a pagan holiday. Read Jeremiah in your bible to see how God feels about Christmas trees. He hates them. Jesus is the lion of the tribe of Judah, not goat. Jesus’ birthday is the Jewish day of atonement. He is a Leo. Real Christians don’t celebrate Christmas. 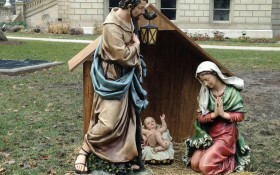 As a christian, we should not be putting graven images on anyone’s yard, especially gov buildings. Separation of church and state. Those atheists are all worked up over nothing. Fools. These atheists will have all of eternity to enjoy the results of their evil lies. It would be nice to get to spend all of eternity without people like you. Hypocrites who enjoy the thought of people being tortured. Sickos. Well, they better tell obozo because he believes in Allah ha ha. He doesn’t take kindly to being told he’s wrong, although he always is. To the man stressing about voting, just don’t vote. Be politically incorrect. The elections are rigged. Zuckerman, owner of Facebook and a Rothschild, has already accidentally told the winner. The powers that be are criminals aka illuminati. We need to revolt and get these monsters out. Wake up america. Deport all rag head mussies. Start today. Who Do These Atheists THINK Created this Wonderfully Intricate, Complicated, Unique World We Live In???? Who Do They Think Created the Vast Number of Animal Species??? Not to mention Humans and The Wonderfully Complicated Creatures That We are???? Are Atheists Arrogant Enough to Think that THEY created all these things??? If So, They are Totally Misguided!!! Are you really that dumb? I can’t even with this response. The dumb coming off of you is just too great. Do these people realize that “Winter Solstice” is a Wiccan religious holiday? And atheism is a religion, as well? The religion of believing there is no supreme being. Do they have proof of their religion? There is plenty of proof for those do believe in a supreme being. Makes one wonder who the fools really are, doesn’t it? Who is more sane, those who believe in a God they cannot see, or those who fight against a God they don’t believe exists? Do they also fight against Jack Frost, the Tooth Fairy, the Easter Bunny, and the Great Pumpkin? Or could it be that something about Jesus Christ got to them? We really are in a spiritual battle that can only be won in each of our lives by prayer and speaking God’s Word. Hey Moron, we aren’t fighting against a god that doesn’t exist, we are fighting against people who think they are better than everyone else. We are fighting for equality, something that Christianity has been against since the beginning. If one studies the nuances of each individual person’s beliefs with regard to spiritual matters, there will likely be as many views as there are individuals. There are collections of people with similar views but if one examines the fine points, they all differ. The rights guaranteed me by the Constitution and the Bill of Rights are guaranteed to those who believe whatever they want, as long as they do not advocate the violent overthrow of the government or promote criminal activity. I know atheists and agnostics who enjoy Christmas for secular reasons. I know Christians who believe Christmas is a pagan holiday and borders on blaspheme. There are people who don’t believe Jesus was born at Christmas time. All I can say to the atheist and agnostics is Merry Christmas and Happy New Year! You misguided fools, listen to the atheists for they speak the truth. Prayers are just wishes that achieve absolutely nothing. In god we trust – what a joke and an embarrassment. You have a set destiny, and only you can change it. have become disheartened by the facade of indifference. friends and relatives, even your pets. Yes, animals have souls. You need to take a Bible study class with Calvary Chapel. You have but one life, one soul. soul to spend eternity, is all up to you. Our constitution gives us freedom to practice our religion of choice, it did NOT say freedom from religion. All I can say is I am a Christian and I feel sorry for you haters. But I would ask you one simple question since you are too stupid to recognize God in the world around you, what if you are wrong ? Um…so why exactly do you think people with Christian beliefs should be able to express those beliefs publicly while people with other beliefs should not be able to express their beliefs equally publicly? This sounds to me like Christian jihadism. and do not murder you if you reject it. oceans, do murder you, not nicely, either. loop, you are an infidel, and therefore ripe for beheading. Christian’s deserve everything they get and what ever comes from the Atheists… first, Christianity is the most direct Religion in the World; but, most of the self-styled Christians don’t have a clue about the basics of their Religion… by the way, in being uneducated in the basic terms of their Religion they operate just like the Atheists who don’t understand the basic tenants of their ‘religion’ – if they did, they would know they are members of the Humanist Religious Cult. 2] April 1, 185; City of London [probably Piccadilly Square]. The Atheist religious sites should be a temple at the Linnaean Society and April 1, 1708 and somewhere in Piccadilly Square [these dates and sites works perfectly and are a masterful Atheist stroke because they are Vague Theory, just like all of self-styled Atheism [which apparently is Humanism under false colors, what else would society expect]. Now what Christians should is file Exparte Orders directing the Atheists to celebrate, with whatever the Atheists Humanist scenes might be, on their Holidays and at their sites; because, Atheists messing with our holidays while ignoring their own [so we don’t get to ridicule them and their stupid beliefs] is all sorts of Micro-aggression against Christians and direct = insensitive defamation of our ethnic Religious beliefs [probably rising to be Hate crimes against Christians]. No sigh of Atheist intelligence here. Nope, looked all over this lot and nothing evolving here ! Atheism like Humanism does not seem to evolve beyond blind faith theory. “Atheism, a belief that from nothing came everything”… What ??? Don’t mow this lawn, Atheism is still evolving. And, we are sure you can think of better signs for the phony Atheist : Humanist religious days. Just a few thoughts – feel free to take them and run with an ever evolving humorist trashing of Atheist dolts everywhere. Remember, the basic : fundamental Humanist : Atheist proposition is that “in the beginning there was nothing and suddenly there was a big bang from which all energy and matter were created”… and so, we see they are so inept they do not see that their basic premise “from nothing came everything” defies every scientific theory they have ever made up… which pretty much defines stupid. …there is Real Science, Real Science is neat, consistent, interlocking, and dependent, and should be rigorously pursued – while the stupid Atheist blind faith, Voodoo science, theories should be properly mocked and disparaged every where, all the time. for that belief, and still do on a daily basis. It is a belief in God’s Son, and His promises to us. Obama is a major fulfillment. Daniel 11. These barbarians are another fulfillment. The growth of the Oriental army. The killings of family members: no love there. The climate, the earthquakes, the signs of these times. Israel. It is all being put together like a puzzle. It seems kind of silly, ATHEISTS DEMANDING GOD-GIVEN RIGHTS. It’s THEIR creator. As in each person gets to choose who they think created the world. You put the emphasis on the wrong word. Atheists are just smart enough to put their trust in science and not some god who is clearly the idea of men who want to rule the world. What all these so called educated people seem to miss is that our freedom to chose is based on an inalienable right from a Supreme being that no government can take away. Remove this Supreme being who most of us know as God from the scene and we become slaves of whoever controls the government. Our laws are based on a Christian-Jewish belief that we are all endowed with the freedom to choose that no government can take away.